I was installing newest version of my PSWinDocumentation module on Windows 2016 when I noticed I can't really get anything to update. I was getting message as below which seemed a bit weird because it was working few minutes ago and only thing I did is to change trust for PowerShellGallery. PackageManagement\Install-Package : Unable to find repository ‚https://www.powershellgallery.com/api/v2/’. Use Get-PSRepository to see all available repositories. 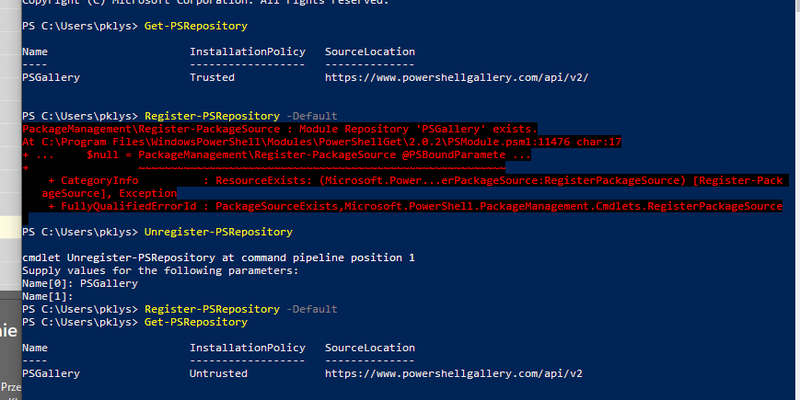 PackageManagement\Install-Package : Unable to find repository 'https://www.powershellgallery.com/api/v2/'. Use Get-PSRepository to see all available repositories. Trying suggested way I've verified that PSGallery settings are actually correct and as expected. What was even weirder Install-Module worked as designed. Get-PSRepository to see all available repositories. While I've finally fixed this issue I'm not sure which of the steps I did had the right impact. Therefore… worst case scenario … do it all. This actually unregisters PowerShellGallery and registers it back. This should work when the bug in PowerShellGet will be fixed. This issue can be visible on the screen below. First, we have a working PowerShell Repository, then it's unregistered and when you register it back it's missing slash. This is my top choice to fix this. I actually did this couple of times with closing PowerShell window and without getting always same message. Finally I went for reboot. Which makes sense because the very package responsible for updating was busy updating. As with any critical system problems a reboot is good way to have a clean start. Some settings can't update while system is running.